Back in the day, I would post "guest blog entries" from readers. I had a form for this and everything. Today, if you want this treatment, you're going to have to send me an email. That's what Jason from Sudbury did, and this entry was written by him. First, @Toronto Mike: Thank you for publishing this, I really appreciate it. So my parents are moving to Waterloo next month and I'm being sent on a mission. My mission...help them get internet. My mom has no clue about upload/download speeds, caps, etc. So I have to look around for them. They're looking for highspeed, they have a 50 mb/s connection right now which is good. I'm also trying to avoid Rogers and Bell, especially Rogers cause I know they have an 80 gig cap. They got an android box so I'm trying to either find a plan with no cap or if anything high enough that I know they won't go over it. Here's where you guys come in. If you live in the Waterloo area, who's your ISP? How much are you paying? Do you have a cap? Help me be a good son and get my parents internet. These guys... and no one else. 400GB cap is more than plenty. Local (London), personal service...great price, great bang for the buck. That I can help you on. There is also kw.igs.net. They've also been around since the 90's. Their website is still up & running but I have no idea who owns them, etc anymore. There is also http://www.worldline.ca/services/high-speed-internet/dsl/ They started a dial up company called 295.ca which was dial up internet for $2.95. I believe the mothership is Fibernetics which is located in the region. I separate my business traffic & residential traffic at home (dual connections). My residential cap is 400 GB a month. I have no cable and rely entirely on Apple TV and Netflix. I have never exceeded the cap. Also, you'll find more flexibility with DSL in terms of what region the provider serves. And while DSL is slower it's usually solid in terms of performance. Cable internet can slow down at peak times. With DSL you get your own circuit. PS. Thanks for supporting an independent provider. 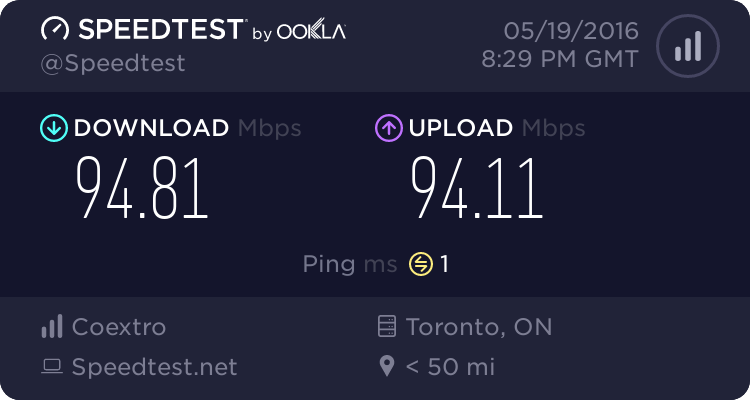 I am in Kitchener and have DSL through Fibernetics - they bought my original provider along with a bunch of other small providers all over the country. Their residential services are now marketed through Worldline (see above). I have been very satisfied with them, they have an optional unlimited bandwidth and also will bundle up home phone and long distance services. A lot of the university crowd swears by TekSavvy, but I have not had any compelling reason to switch. Cost versus performance seems very similar. A bit more detail - I have DSL 10, which nets about 8.5Mb/s according to Speedtest. For $5/month I would upgrade to DSL 15, but it would mean a new modem which I don't want to pay for right now. For a new install I would not hesitate. As is, I can stream Netflix at 1080p on my TV while several other computers are on-line, without any issues. Cost is as per the website - $45/math. Yep, they bought out Nucleus Information Services in Alberta/BC a couple years ago. Worldline started as a long distance company that affiliated itself with newspapers (Toronto Sun Long Distance). You dialed a number, listened to an advertisement & then called your number. It works on cell phones too. It was an early incarnation of VoIP. The owners of the company (Jody/John) had great ideas but were admittedly ahead of their time getting their first venture off the ground. TekSaavy had no bandwidth caps so that might of interested in the university crowds when file sharing was at it's peak. Those still matter as the vast majority of internet traffic is now Youtube & Netflix. There was also SGCI but it appears they were sold & no longer do internet. Sorry Anonymous was me. 10 Mbps is about as low as I'd got if you're streaming Netflix. 15 Mbps should easily suffice given their older folks without a flock of kids around. Idirect.ca. I remember that company long long ago (early dialup provider). I think they had some association with Tucows too (which is Canadian). I also remember Look. It was an interesting idea, but the concept of an antenna on a house was probably too much for most. It would have made more sense in rural areas of the country at the time. I get the whole email thing. Email is pretty much a "must have" in life, yet it's still pretty clunky overall. Change is difficult & if registering with a service like Gmail, you don't have much choice name wise (unless you want joe.blow.125547 or something. Hmm. Start looks good and their prices are reasonable. I know they won't even come close to using 400 gb a month. Gonna look into TekSavvy too. The other interesting thing with Start, looks like they also provide service in Sudbury too. I've got Eastlink now, but I've been wanting to look for something better and cheaper so Start might be an option for me here in Sudbury. I need to look into it further though. The they provide service pretty much wherever Bell,Rogers,Cogeco,Eastlink, etc are. They are a wholesaler, not a reseller (big difference). I've been with them for 3 years now and very happy. Dial them up and talk to someone. That simple. Primus is the best. Their customer service is the best. Bell is always calling me. I don't want Bell because Primus is the best. I think you should do primus so that you can stream the orioles on your moms TV. The orioles are going to win the world series because they are the best or the Diamond backs might. I want both to win so I win my baseball pool. Some guy died and that ruined the pool for a week... I don't understand why people die during fantasy baseball season. Primus is the best. It took me your 3rd mention of Primus before I caught on. Thanks for reminding us of that vintage Cheryl moment (guy in the baseball pool dying before the conclusion of said pool). Brilliant. Speaking of internet speeds, check out fast.com to test your internet speeds. It's a little smoother than speedtest.net. I never want to move. While ago I secured a CISCO wireless system. Downstream was nearly 300 Mbps of internet when it was wide open on a Saturday. I occasionally go to Seattle and they have gigabit fiber to the house in some places. Me wants. And it's relatively cheap too. Cambo, you post messed up your post. Who is the wholesaler you are recommending? I am using https://www.acanac.com/ and believe me it is the best out there in terms of service and price. you can save easily $240 every year.